Magical. This 1 1/2 ctw estate yellow diamond engagement ring has an unbelievable amount of sparkle. Your attention is pulled to this one carat European-cut diamond (1.20 ct tw, VS2, N). This spectacular clear light yellow center diamond is on fire. Framing this middle diamond are two bright white, old European-cut diamonds. These three diamonds are held in a bi-color mounting. Closest to the diamonds is a four-petal flower engraved bypass ring in 14kt 585 white gold. A special ring for a very special someone who enjoys the uncommon. Old European-cut diamonds are often mistaken for old miners diamonds. 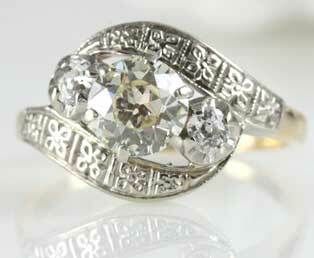 This diamond cut was the most common diamond cut in the early 1900s. They are similar to old mine cut diamonds, as both have high crowns fewer diamond facets, and both diamond cuts come to life in low light.